Former Defense Minister Amir Peretz demands that the government work to bring back the bodies of Hadar Goldin and Oron Shaul. 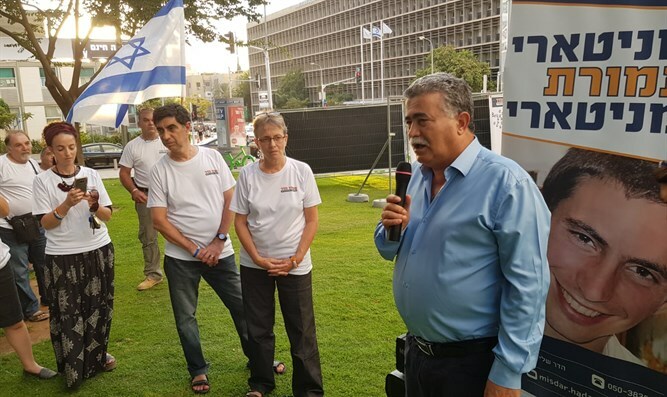 Former Defense Minister Amir Peretz took part on Sunday in the special beret formation of the Misdar Hadar organization, marking four years since the end of Operation Protective Edge in Gaza without the return of the bodies of IDF soldiers Hadar Goldin and Oron Shaul. He noted that "the Goldin and Shaul families are running one of the heroic battles we’ve seen in the state of Israel. The families are waging a battle over the basic values ​​of the state of Israel and the IDF." "The ability of the State of Israel to continue sending its soldiers to war depends on how and when this battle ends. A government that receives the right to send our sons to war has a duty to bring them back home. If this alliance, between the families who sent their sons [to the army] and the Israeli government on the right or the left is broken, one of the most meaningful and valuable things in the state of Israel's ability to protect its security will be broken," Peretz said. He added that "in any arrangement, agreement or hudna (the Arabic word for truce -ed. ), the boys must be an integral part of the outcome. Not the discussion, not the talks, but the outcome." Hamas has been holding the bodies of the two IDF soldiers since the 2014 Operation Protective Edge.